If you want to catch Tabuk Philippines at its most colorful and most lively time, come and attend the Matagoan Festival which is held on the Foundation Day of the city every June 24. During the street dancing, the thoroughfares of the city fairly burst with colors as the participating ethnic groups don their native customs. The vivid bright colors of Cordillera ethnic groups dominate the more subdued hues of the Tagalogs and Ilocanos. There is also a wide variance in the sound, as the Cordillera natives beat their gongs while the immigrants rely on the guitar and banduria for the music they need to accompany their dances. When it was first celebrated in June 2002, the Matagoan Festival was meant to showcase the rich mix of cultures of the city acknowledged as a veritable melting pot. Thus, aside from the street dancing, “Nataguan di Tago,” where the Cordillera ethnic groups present their rituals for special occasions in the life cycle. For example, the Guilayons ensure the good fortune and health of their members through the gabbok, a ritual performed by the mandadawak on newborn children. Included in the cultural fare during the Matagoan Festival is the dornat or the renewal of the bodong. The bodong is the native peace pact practice prevalent among Kalinga tribes which still exists during these days. The Matagoan Bodong Consultative Council (MBCC), the peace-making arm of the LGU here, sees the need of enacting the dornat during the festival to highlight its importance in keeping the peace among native Kalinga tribes. In its continuing efforts to find lasting peace in the city, the MBCC pushes for regular renewal of the bodong as a means of reducing the tendency problems marring their relations. With its wide lands and its being the center of education, government activities and commerce, Tabuk Philippines is host to myriad activities intended for the survival and improvement of individual and family life of its residents. To disrupt these activities through disturbances in the peace is precisely what the MBCC wants to avoid. 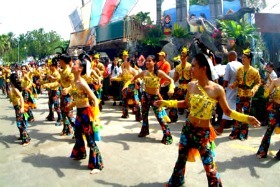 One of the intents of putting its culture to the fore during the Matagoan Festival is to attract visitors to the city so aside from the usual cultural activities, the originators have come up with unique culture-based gimmicks. For example, in 2008, the organizers tried to establish a record of the longest bamboo-cooked rice through the “The Longest Linudag.” The activity involved the use of the old practice among Tabuk Philippines natives of cooking rice in bamboo cuts and then displaying the bamboo cuts with the rice still intact in them along the road. Further back, the organizers demonstrated the processing of bungsos or salted pork entrails intended to thicken the soup and make more tasty chicken and duck meat. The bungsos was introduced by the Mt. Province natives to the local culinary fair. But the native culture-inspired activity which has become a permanent feature of the Matagoan Festival is the Matagoan Run, a 7KM marathon wherein the runners are supposed to wear nothing but G-string for the men. As for the women, they are supposed to be in tapis or the native wraparound skirt and also barefoot. The festival is also an opportunity for Tabuk Philippines to show off the city’s tourism destinations. To carry this out, treks to Matambong and Bangabanga Falls in Amlao and water rafting on the Chico River are organized. The city is claiming the title as White Water Rafting Capital of the North.